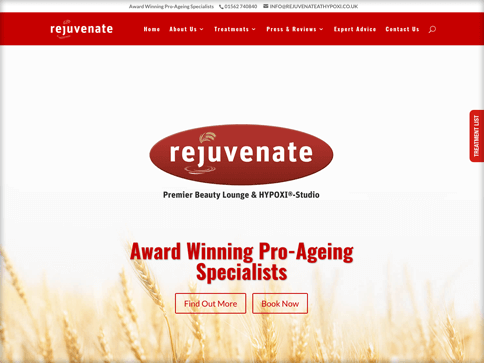 We have been working with Rejuvenate & HYPOXI-Worcestershire for years and have refreshed their website on a number of occasions to keep up with modern trends and styles. However, the time came to really overhaul their online presence and embrace the need for a responsive & interactive website. With awards to be entered, we really pushed for a new look and design, alongside a shake up of the navigation to appeal to all generations they deal with in their industry. 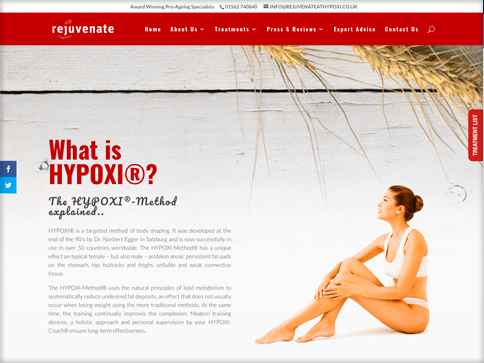 We made the site more dynamic by creating an interactive body with hot points to showcase problem areas of the skin, health & body which has been a huge hit. We also added a quick access link to their treatment brochure by using a floating tab on each page. Since the website has been live, they have had such great feedback from all existing clients and also new clients who were drawn to them with the help of their professional, modern and promising website.